Fischer & Kerrn’s Software Products can be used as on-premise solutions or as hosted solutions. 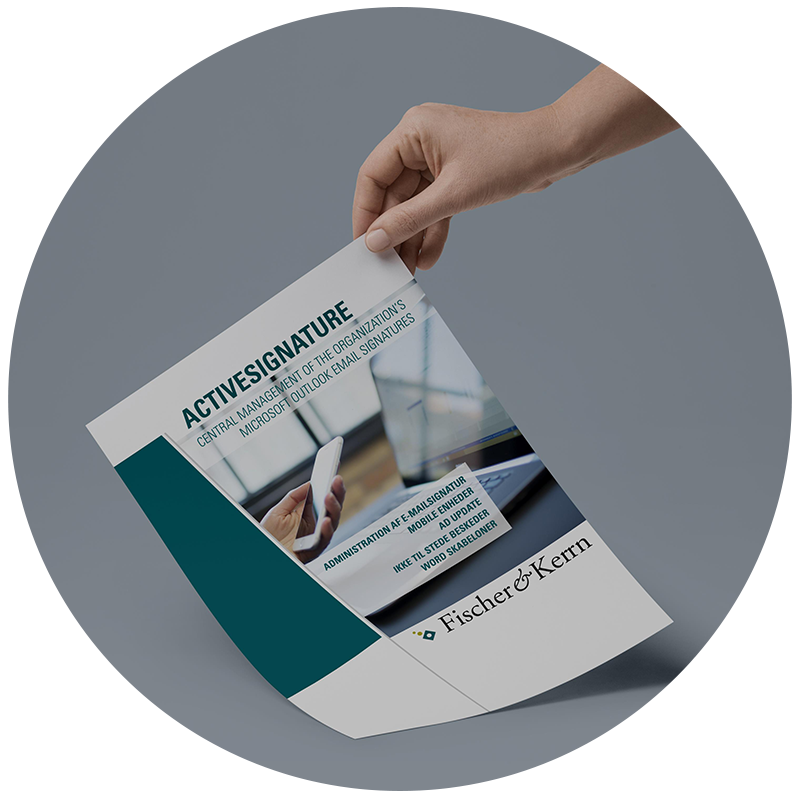 ACTIVESIGNATURE and BUSINESSMAIL can only be used as on-premise products. CONCIERGE BOOKING SOFTWARE can be used as either an on-premise solution or as a hosted solution. We do not collect any information when the Software Products are installed on-premise. All information is owned by the customer and Fischer & Kerrn do not have direct access to any data. Name and contact data: When signing up for CONCIERGE BOOKING SOFTWARE we may store name, email address and operating system. Location data: We do not store your physical location when using our mobile app. Usage data: We collect data about how you and your device interact with our Software Products. This information is used to improve our products and to provide you with even better services. The usage data that we collect cannot be tracked to you personally. Demographic data: We collect data about what country you are from and your preferred language. Meeting data: We collect information about your resource bookings and the meetings you book in Microsoft Exchange and CONCIERGE BOOKING SOFTWARE. The information we collect is the name of meeting participants, meeting participants’ email addresses, meeting length, resource booked, catering and other services booked, and cost code information for invoicing. Visitor data: We collect information about visitors that have been booked for a meeting and visitors that have been registered in CONCIERGE BOOKING SOFTWARE. The information we can collect is the name of the visitor, email address of the visitor, company, mobile number and car license plate number. When you visit our websites you do not provide any personal information about yourself. When you submit a form on our website, we request that you provide personal information (usually name, email address, company name, telephone number, and country). This information is kept safe and is not sold or distributed to a third party. The personal information you provide on our website is used to provide you with a better service and more accurate information. We also obtain information from third parties such as Google Analytics and other companies to help us determine location and behavior. When you sign up to our customer portal www.portal.fischerkerrn.com we collect personal data such name, email address, company name, country and your personal username and log in code. This information is used to identify which pages you should have access to on the customer portal. The customer portal also contains information about your company, your support tickets and the set up you have with our Software Products. We also use personal information to respond to customer support requests and fulfill our business obligations towards our customers. We publish customer testimonials and comments on our websites which may include personal information. Before publishing the testimonial or the comments we have received the customer’s consent. We may use navigational information alone or in combination with personal information to send information about Fischer & Kerrn that we think are relevant to you. If we for some reason should be acquired by another company, that company shall receive all personal information gathered by Fischer & Kerrn. In this event, you will be notified on our websites and by email. In Europe, we utilize the North Europe (Primary) and West Europe (Secondary) Azure regions. (Please see attached infrastructure document for details.) The service is fully managed by Fischer & Kerrn. Maintenance and updates are included in your subscription. In North America, we utilize East U.S. (Primary) and West U.S. (Secondary). Learn more about regions here. All secondary data centers (West Europe and West U.S.) works as a storage and geographically redundant backup. Because Fischer & Kerrn’s Software Products are based on a Microsoft Azure platform we leverage Microsoft’s compliance program. Microsoft and its U.S. subsidiaries state that they comply with the EU-U.S. Privacy Shield Framework as set forth by the U.S. Department of Commerce. You can log on to our websites using single sign-on. We use a cookie for this. This single sign-on service will authenticate your identity and provide you with the option to share personal information such as your name and email address. To do any of the above actions please contact us at privacy@fischerkerrn.com. Fischer & Kerrn’s Software Products and websites are not intended for children younger than 18. If you suspect that a child younger than 18 has provided us with personal information, please contact us at privacy@fischerkerrn.com. We will immediately delete all records on children younger than 18.